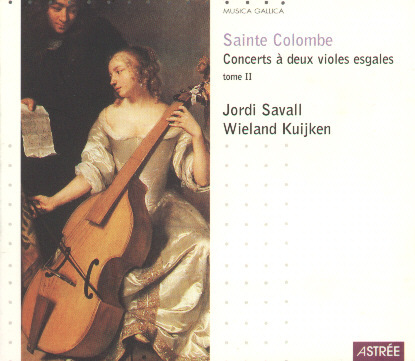 When the complete works of the mysterious Sieur de Sainte-Colombe were published in 1973, few viol players had even heard of him. The music, concerts for two equal bass viols with its cascades of unmetred notes, was unlike anything seen before. While of considerable pedagogic interest for the way they teach musicians to play in an improvisatory fashion, they were considered rather difficult to bring off in concert. But if anyone could, it would be Jordi Savall and Wieland Kuijken. 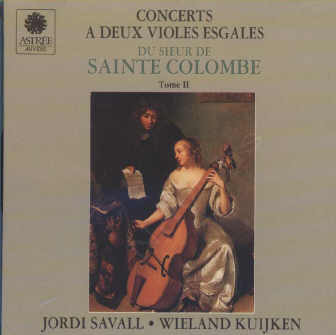 In 1976 they recorded five, which were subsequently reissued on CD in 1988, and now five more in 1992, in the wake of the success accorded the fictional film Tous les matins du monde (about the relationship between Sainte-Colombe and his pupil, the court viol player Marin Marais), for which Jordi Savall provided the soundtrack. There is in fact a tremendous difference of character between the performances. The earlier recording now seems to have an air of gruff perfunctoriness about its pacing, as if the players were somehow ill at ease. The force of the music had evidently made a lasting impact on Savall, who used several of the movements—from "Le retour" and the "Tombeau les regrets"—in the film which he re-recorded with his former pupil Christophe Coin. It is all the more interesting that Savall should have collaborated again with Kuijken on a second CD, and to such extraordinary effect. We have in the second recording a series of refined virtuoso dialogues. The rapport between players and with the music is sublime: elegiac in the extended passages of echoes in La conference, wonderfully seductive in Le tendre (which was also used in the film soundtrack) and almost able to make time stand still in La rougeville. Gone is the tension one senses in the earlier recording, replaced by an unrivalled rapport that will be truly satisfying to those who have avidly followed their musical development during the intervening years. I enjoyed this second CD immensely. "Comme deux restaurateurs consciencieux, Savall et Kuijken suivent les pas du secret Sainte Colombe, compositeur obscur et solitaire remis au goût du jour par le film Tous les matins du monde. Lui aussi remasterisé, l'enregistrement nous emmène dans les sphères les plus hautes de l'émotion humaine. Un des plus beaux disques de viole à notre connaissance." (La conférence - 1e Gigue - 2e Gigue - Ballet - Gigue "L'aisée"